Next year's tuition increases are coming in, and the average seems to be between 3 and 4 percent at elite private colleges and universities (Stanford, Bryn Mawr, Princeton, Dartmouth, MIT, Ithaca College Marquette). Tuition will be up across a wider range at publics (9 percent in Colorado, 10 percent in the Louisiana and North Carolina systems, but no increases at Purdue, the University of California or Cal State). The Consumer Price Index is forecast to rise around 2.3% for 2013. The national outcry against the tuition and student debt escalation has had no obvious effect on the sector's longstanding tendency to raise tuition at 2-4 the rate of CPI. See the gruesome visual below. The public has an obvious right to be upset about absent college affordability at a time when college remains the necessary condition for a decent stable income while at the same being no longer sufficient. Students are taking on debt to buy a high-priced ticket to "Intern Nation," nicely covered in the New York Times piece over the weekend on the "No-Limits Job" that college grads are now heir to. What's bad for students has been good for Wall Street. The Wall Street Journal reports this morning that "Student-Loan Securities Stay Hot" even as student default rates climb. "Demand for the riskiest bunch" of student-loan backed securities sold last week by SLM Corp, formerly known as Sallie Mae, "was 15 times greater than the supply." The riskiest securities have the highest yields, but investors don't have to care, given the special impossibility of defaulting or erasing student loan debt. Meanwhile, the New York Fed reports that 90-day delinquency rates have risen from 24 to 31 percent since 2008, and that student debt nearly tripled in the last eight years. When the Fed breaks out the numbers for Intern Nation--graduates of the past eight years--they found that "the delinquency rate jumped to 35% last quarter from 26% in 2008." The only remedy for current debtors would be widespread debt relief. Movements led by Strike Debt are seeking exactly this (see a discussion in Dissent, an interview with a leading organizer, NYU professor Andrew Ross, and a Forbes view with some good links). But I know of no support from university administrators for student debt relief, even as tuition hikes continue to inflate the debt bubble. For future students, budgeteers and their political bosses are looking in the wrong place to cut costs--namely, in undergraduate instruction. Good evidence for this came last week from retired UC Berkeley physics professor and independent UC budget maven Charles Schwartz, who has published an important update of his estimates of the cost of instruction at UC. The basic problem is that universities have always bundled various costs together, so that the costs of instruction are hard to define. The mainline higher ed accounting body, the National Association of College and University Business Officers (NACUBO), continues to support this bundling. Other organizations, the Delta Project most notably, have separated instructional from research costs (e.g. Figure 9), but methodological complexities remain. Public universities like UC do estimate the per-student "cost of education," but research and other non-educational expenses appear to inflate the alleged instructional cost. To take Prof. Schwartz's example, the University of California, UC's Office of the President estimates educational cost per student as $17,400 (2011-12). Average tuition is a bit over $13,000 per year, and up to a third of that is returned to financial aid, so UCOP estimates that net student tuition covers just under half of instructional cost. Prof. Schwartz, in contrast, estimates that average cost per student is actually $6910. This is 40% of UCOP's estimate. From the perspective of UCOP’s Budget Office, looking at the cost to UC: UCOP says Student Fees (net) cover 49% of their cost and I say it is 127%. From the perspective of students and their families, looking at the sticker price: UCOP says Student Fees (gross) cover 74% of their cost and I say it is 191%. First, analyses and critiques of Prof. Schwartz's methodology and findings. His many budget reports, extending back at least two decades, are works of scholarship in the sense that they define their methods, identify and publish their data, and explain each calculation on the way to the conclusion. They deserve to be treated with the academic standard of rigorous peer review. For example, Prof. Schwartz uses Activity Based Costing, and his estimate of instructional cost depends in part on a time-use survey that suggests that UC faculty devote 21% of their time to teaching. I think this estimate is low as a UC average: it may be two or even three times higher for ladder faculty outside of the natural sciences and engineering fields that have lower teaching loads to reflect their obligations to their sponsored research. A recalculation using higher teaching share estimates would raise the per-student instructional cost somewhat--though the adjusted figure would remain far closer to Prof. Schwartz's than to UCOP's. Unfortunately, this series of reports has been ignored rather than critiqued by budget officials. The Academic Senate has been part of this syndrome--and I include myself in this observation during the period when I chaired Planning and Budget committees on my campus and at systemwide. Research faculty correctly believe that teaching and research are intertwined, meaning that research expenditures wind up back in the classroom and should be counted in part as instructional expenses. I believe this too--as does Prof. Schwartz, as far as I know--but this would lead to a further adjustment of his cost estimates. If we kept his methodology and make these two adjustments, instructional costs might get up to around $9500 / per student. (I'm eyeballing here, not re-running all the details). 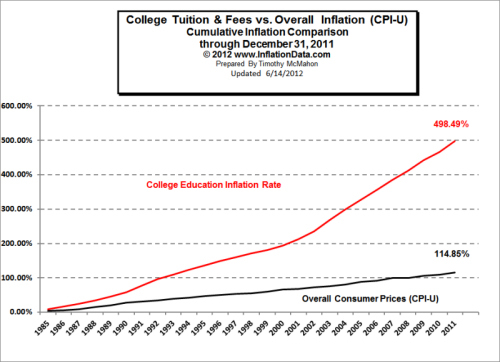 This is still well below UCOP estimates and below in-state tuition. So Prof. Schwartz's basic argument would remain intact. We should be having this debate about actual instructional costs, starting with the Schwartz calculations: it is a major national policy and political issue. And if students are racking up life-damaging debt to pay far more in tuition than they get in teaching (broadly defined)? This is exactly the impression senior managers hope to block by avoiding debate, but this strategy stopped working long ago. Second, bloated teaching cost estimates have fueled the national bid to fix colleges with technology. Bob Samuels has made this point in so-far futile efforts to instill realism in state agencies about real university costs. Are MOOCs supposed to save UC 15% at a $17,400 per-student instructional cost? What percentage of courses need to be removed from faculty and grad students to close UC's looming $1.5 Billion structural deficit? What if UC spends half of what UCOP says on teaching? So far, these questions aren't being addressed at all by MOOC advocates like Coursera's Daphne Koller, whose presentation to the Little Hoover Commission was financially data-free. The items on Prof. Samuels' list of real cost drivers have far more political clout and cultural capital than teaching does, and it is largely for that bad reason that they aren't being seriously addressed. Online boosters need to be held accountable to actual current teaching costs, not to ones that have stayed inflated for political reasons. At the moment, the debate based on opaque teaching costs is offering students the worst of both worlds--no meaningful containment of the real costs that drive tuition hikes, and more austerity for their instruction. I'd say that faculty even in the sciences contribute 40% time to teaching when time spent advising and running the machinery of academic programs is counted -- supervision of student research, exams, committees, etc. Let's not make the mistake that only time spent directly on a specific course counts as teaching. Prof Schwartz's analysis makes a grounded evaluation of the real (not rhetorical) cost of undergraduate instruction. I've worked through Prof Schwartz's data and reasoning, and find the conclusions compelling, however one works the estimates. Undergraduates are paying more than the cost of *their* education, while the university leadership allows the public to view students as whiners wanting a bigger state handout in times of short budgets. At a minimum, UC should account for the source of the $700m+ it admits to be spending each year as overruns of its indirect cost research budget. For a total enrollment of 234,500 students in 2010, a $720m research "loss" amounts to over $3,000 per student. UC should demonstrate that undergraduate tuition is directed to undergraduate instruction, and whatever happens to be determined to be related to that instruction comes at the request of the faculty who are engaged in that instruction. Organized research is an activity that is not paying its way, and those involved in it should be making a direct case to the state, and to the public, for why organized research should be subsidized beyond what sponsors and donors provide. Make that case. Be as grounded as Prof Schwartz about it. Don't think it's fine to run students and their families into debt, "all for a good cause". There are a few other ways to make this calculation. I looked at actual salaries and teaching loads, and I just divided the senate faculty salary by the number of courses and average course load, and I got a similar number to Schwartz. Also, if professors use grants to buy themselves out of courses, we can use the buyout rate to determine the % of faculty salaries going to instruction (this turns out to be about 25%). It should be clear that when you combine the state funds and the student tuition dollars, you are over $20,000 per student, and this is nowhere near $6,000 figure Schwartz and I give. Also for summer, the state pays, the student pays, and the salaries are reduced. It would appear that the universities are financing a share of their research costs as if these costs are "instruction" and can be bundled with tuition, which then becomes available for federal support in the form of loans to students. In this scheme, it appears that the loans for education do not anticipate that as much as 1/3 of the funds do not go to instruction at all. Research might be "intertwined" but not at this level of financial diversion. I think it is a mistake to equate teaching at UC only with direct course instruction. I spend a large amount of time supporting UC's teaching mission in activities outside of the classroom. @Joel Norris It certainly would be a mistake to do that, but I don't see that mistake figuring in the present discussion. Consider, also, salary escalation (and benefits) based, apparently, on competition to recruit folks who can bring in substantial extramural research dollars and the credentials that go with, quite apart from any capability with, or interest in, instruction. And we should not leave out research that still does take place in instructional environments, and can be every bit as important as the expensive, organized stuff. That we can compile a list of this sort--and there is plenty else-- does not mean that the present rhetoric around accounting for how tuition money is spent is just fine, or alternatively that such accounting is just too difficult and so won't alter the rhetoric if it is sorted out, or that trying to do the accounting will put faculty at each others' throats (in a new and different way) and at odds with the public in some way bound to bring more disaster upon faculty. Bob Samuels took the approach of dividing salary by teaching load. That underestimates the contribution of faculty to the teaching enterprise. I don't agree with the rhetoric that extramural funds are a source of "revenue" to the university, but I don't think it is necessarily a problem that extramural funding is a net cost. UC expects its faculty to do research, and UC would have to pay for instrumentation, computers, etc. even if no faculty sought extramural funding. If students want to be taught by faculty substantially engaged in research, then I don't see why they shouldn't pay a portion of their tuition for that (if the state will not). If we take the view that students shouldn't pay any tuition to cover faculty research, then we might as well be CSU. Thanks, Chris, for taking this up. The Faculty time-use study that I use averages over faculty in all disciplines. Roughly, half of faculty work time (62 hours per week average) goes to teaching (including course preparation, office hours, etc, as well as class time) and about half of that goes to undergrads and half to grads. The survey also let faculty say that some portion of their research time also contributed to instruction. My final number is 21% on average for Professors' work contributing to undergraduate instruction. There is room for minor debates on this number and I always ask for administrators to engage in better data collection and analysis. They prefer to stick with NACUBO's rule. By the way, Delta Cost Project uses data from IPEDS on expenditures for Instruction. This is bloated data since, for research universities, it includes Departmental Research in the cost of Instruction. Norris: "If students want to be taught by faculty substantially engaged in research"
And what portion of the UC undergraduate student body ever gets to talk to a faculty member engaged in research? And what portion of the teaching is done by TAs? who don't have English as their native language? By Adjuncts who paid less than minimum wage? Can you show that the research faculty actually teaches students who learn more than than those who are taught by non research faculty? If could charge as much as Harvard does, could all of the tuition keep a single modern science lab in operation? What Norris is doing is rationalizing sucking the blood out of the young and innocent to feed the old and the fat. It is a crime. I had not realized that 21% was referring only to undergraduate instruction. That makes more sense to me, with another 20-30% devoted to graduate instruction. Nonetheless, I still don't understand the justification for why undergraduate tuition should cover no more than the cost of their tuition. In that case, why have a research university? We might as well send all the students to CSU, where there is a closer match between tuition and direct instruction of undergraduates. All students coming to UC could easily go to CSU. If they choose to come to UC, they must perceive that is has some value to them. Why should they not pay for that value if the state will not? Glad you got straightened out about my distinct focus on undergraduate education (as separate from graduate education). I do that because the largest financial burden is placed on undergraduate tuition payers. The second question you raise - about the "value" of research in undergraduate education - is a topic about which many people may have many different opinions. My investigation is about something more precise and objective: What does the university actually spend to provide undergraduate education and what does it spend on other missions? I think you need to have a fair answer to this straightforward accounting question before you engage in the subjective debate about "values" and what students "ought" to be charged. The primary fact behind my work is that the whole higher ed industry (focusing on research universities) is trapped in a severely warped accounting habit that produces false and misleading answers to this simple factual question about actual cost. So this whole debate is pretty UC centric and misses a key fact about California higher education--we have two massive public higher education teaching institutions-- CSU and the California Community Colleges. Any California resident can attend those teaching campuses at a cost far below the cost of the instruction. And we have one much smaller (in numbers of undergraduates) research university. The fact that California residents are willing to apply in record numbers and attend UC at the current cost shows that there is something unique about a research university and they want to be there. And since over 50 percent of the students get most of their tuition covered by financial aid, the calculations above are all wrong anyway. There are very few students paying more than it costs for their undergraduate education. They ARE paying to support poorer students. The cost of a quality product is not just the cost of materials that go into -- you also pay for the innovation and excitement that go along with it. Manufacturing an iPhone or BMW probably doesn't cost as much more as the price, but the consumer is willing to pay for the quality which is not just the physical quality of the soldering of the electronics -- it is the quality of the whole experience that includes software and customer support and other users and other complementary products... all kinds of cross subsidies, just like in higher education...yes you know you might be in a 500 person lecture at UC Berkeley compared to a 30 person course at SF City College, but you'll pay a lot more to be at Berkeley because there are other tangible and intangible values you are paying for. Including being in an environment of scholarship and creative activity. The fact is, UC policy states in clear text that extramural research must cover the full costs, both direct and indirect. UC attorneys have argued in court that UC policy "has the force of law." The fact is, however, that UC administration has got in the habit of ignoring the law, dipping big-time into tuition funds, and then rationalizing all this, with the help of sympathetic faculty, that research and instruction are so intertwined that (a) it's okay to ignore written policy; (b) it's okay to lead students to believe that they aren't paying the full cost of their instruction, when they apparently are; (c) it's really okay that students are paying by means of running up substantial debt; (d) it's rather a relief to have the public and legislators then treat the students as whiners looking for special privileges when they ask why tuition has had such a huge run-up over, say, inflation. I say, get off the rationalizing of the situation as a way of preventing a clear accounting. It would appear that undergraduates at UC are paying about $3K per year over instructional costs just to cover folks' organized research habits, with another $700m or so yet unaccounted for. Start with an accounting that de-conflates instruction with everything else, and ask which of the everything elses was supposed to be self-supporting, or supported by the state, and now for some reason has gotten either so important, so inefficient, or so clever/lazy/arrogant that it finds it convenient to dip into tuition. Then everyone can in the plain light of day decide whether to follow UC policy or change UC policy, and make the case for the importance of various non-instructional programs to the folks who are then responsible for funding those programs. Right now, students are being exploited, federal funding for "education" is being exploited, the banking industry is having a very fun time feeding financial products to speculators, and undergraduate instruction is being treated as a low priority, as if "inefficiencies" and "high cost of faculty salaries" in instruction are the causes of the run-up in tuition, and more speculation in the form of "innovative" on-line instruction is just the thing. Faculty involved in instruction should be as outraged at the treatment of students, the indifference to student debt, the adverse effects of high tuition/high aid models on attainment, as they should be about the effect of all this on faculty salaries directed at instruction and the resources available to faculty to augment their efforts to provide quality instruction. The financial games being played have *nothing whatsoever* to do with the advantages of taking undergraduate courses taught by faculty or graduate students who are also involved in "research". Those advantages are available, and affordable, without the extra $3K/yr surcharge being tacked on, to be financed mostly by private debt. I want to stres that I offered three different ways to calculate the per student cost. By dividing the total professor's salary by the number of courses, I am taking into account the full range of faculty activities. In no way was I arguing that we should not include faculty research or service. However, I still think we need to see how we fund different parts of the university since students are paying more and getting less while faculty are teaching more and most faculty are seeing their real wages go down after taking into account inflation, pension contributions, and increased healthcare costs. The average lecturer salary has gone down 15% since 2007, so we must ask, where is all the money going. We also know there are fewer core faculty and Yudof has announced that there will be no salary increases.